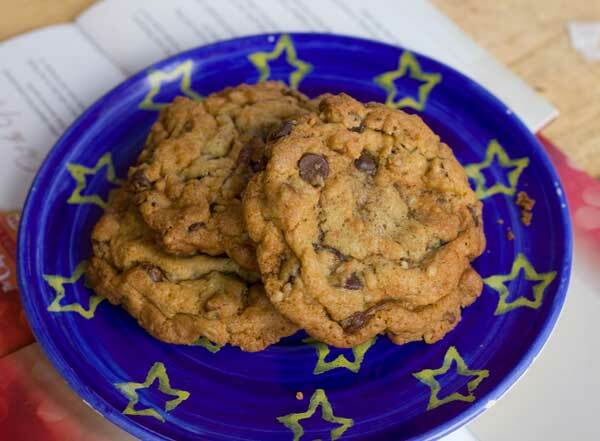 The texture of these cookies makes them special. They're chewy, sweet, and loaded with nuts, chocolate and coconut. Preheat oven to 350 degrees F. Line a rimmed baking sheet with foil. Place pecans on the baking sheet and bake for 6 to 8 minutes or until they start to release their oil (become shiny). Remove from the oven and toss with the teaspoon of butter. Sprinkle with salt and let cool. Chop. Wipe the rimmed baking sheet clean and lay the coconut on it. Toast for about 6 minutes or until it is golden around the edges. Let cool. In large bowl, using an electric mixer, beat the cool butter, brown sugar and granulated sugar until creamy. Beat in the egg and vanilla until they are combined. By hand or using lowest speed of the mixer, stir in the flour mixture. Add chocolate chips, toasted pecans and coconut to the dough and stir well. Using a (generously!) heaping tablespoon, scoop up 15 mounds of dough. You can bake them immediately, or scoop them onto a foil lined tray, chill, and bake as needed. Arrange about 3 inches apart on foil-lined baking sheets. Bake one sheet at time for 12-14 minutes or until cookies are golden brown. Let cool on baking sheets for about 5 minutes, then transfer to a wire rack to cool completely. -- For the chocolate chips, I used what I had on hand which was a mixture of Guittard extra dark and Hershey's Dark.